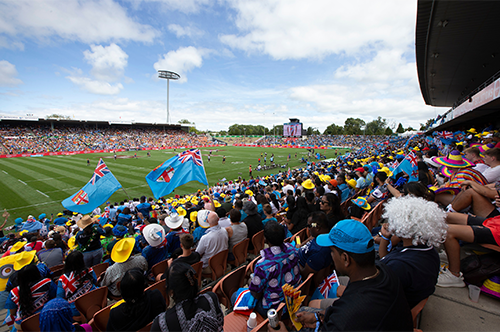 A near-capacity crowd soaked up the action on and off the field during Day 1 of the 2019 HSBC New Zealand Sevens at FMG Stadium Waikato today (26 January). 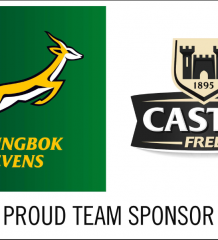 HSBC NZ Sevens General Manager Steve Dunbar said the second edition of the event kicked off in style and fans had embraced the event’s festival vibe. “We couldn’t have asked for more,” Dunbar said. “The rugby was full of action, it was a special moment to see our Black Ferns Sevens play, and win, in front of their home crowd, and the venue was nearly full. A small number of tickets would be available to buy at the gate on Sunday, but Dunbar said fans would need to arrive early to secure a seat. Managing Director 37 South, and co-promoter of the event, Dallas Fisher said Hamilton city had been buzzing all week and that energy had overflowed into the match venue. Fisher made special mention of the Fijian fans who turned out in force for the second year running. Fisher reminded fans attending finals day that if they planned to leave the venue they needed to ensure they returned before 6.00pm for re-entry, a requirements of the event’s liquor licence. Waikato Police praised event organisers for a calm opening day. Police made one arrest and 10 people were evicted from the venue. Detective Inspector Hywel Jones said crowd behaviour had been encouraging. St John District Operations Manager Stuart Cockburn said only one patient had been taken to Waikato Hospital and a small number treated for minor ailments. Fans had been sun-smart and taken advantage of the free water and sunscreen but needed to remain vigilant with a clear day forecast for Day 2. The tournament itself is set up for a compelling finals day with the All Blacks Sevens and crowd-favourites Fiji both unbeaten through pool play. The All Blacks Sevens started with a 52-0 over Japan, beat Canada 49-10 then finished the day with a 24-0 win over Spain. The Black Ferns Sevens celebrated their historic first international tournament on home soil with a hard-fought 19-14 win over England then beat France 24-5 in a repeat of the Women’s Sevens World Cup final. An injury to Sarah Hirini (nee Goss) in the first match against England was the only blight on the day. The Black Ferns Sevens captain limped off early with an ankle injury and was later ruled out of the rest of the tournament, with Tyla Nathan-Wong replacing her as skipper.